Recently on the bookstore shelf, this tome caught my eye. 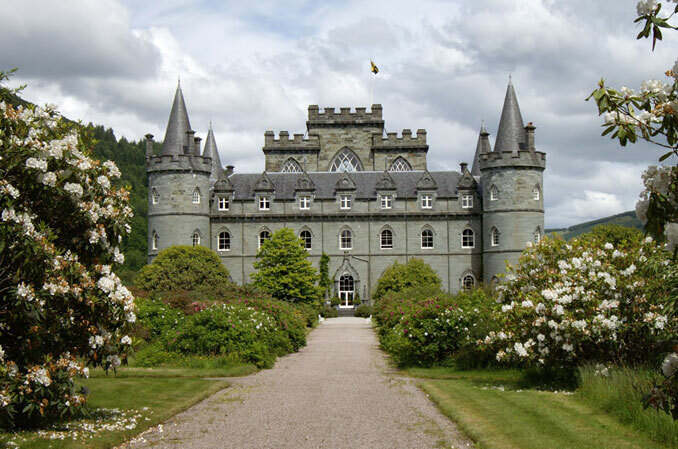 The Scottish Country House celebrates the great homes of Scotland which have been lived in by the families that built them or those who have owned them for generations. 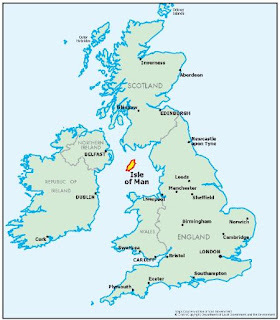 I have never been to Scotland though I have been to Ireland, where my great grandparents hailed from, and to England. Scotland would be a fun trip some day. While looking at the book I was reminded that on the last episode this year of Downton Abbey, the Grantham family took a trip to Scotland where they visited Lord Grantham's cousin Shrimpie Flintshire. The scenes in Scotland were filmed at Inveraray Castle on Loch (that means "lake" but you knew that) Fyne in Argyll. We all know how that trip ended... Every time someone has a baby at Downton Abbey, a major character dies. 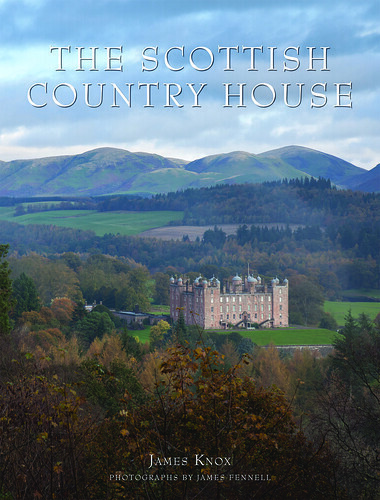 The Scottish Country House, which is written by James Knox and photographed by James Fennell, visits ten grand houses and castles for an up close look at how the Scottish landed gentry lives. I was struck throughout by the use of color in rooms. Some rooms had creamy colored walls and bright sofas and chairs in raspberry or sapphire of daffodil. 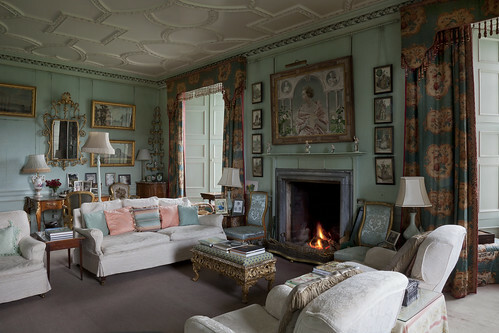 Other rooms had neutral colored furniture but boldly painted walls like this mint green sitting room. 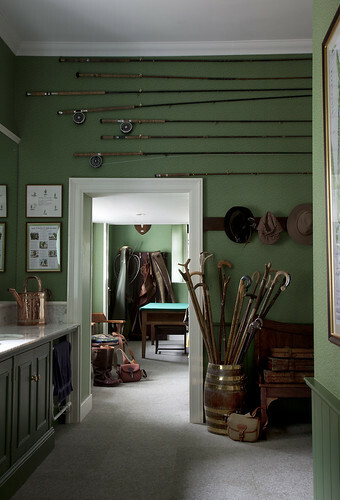 This rod room features fishing poles, walking sticks with horn handles, and emerald green wallpaper. And really, every house needs a rod room! 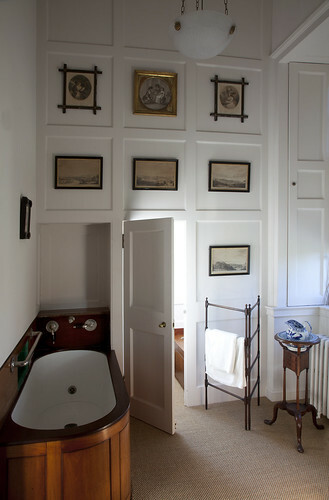 I like how the art work was hung in this simple Victorian bathroom which reminds me a little of the upstairs one at 611. 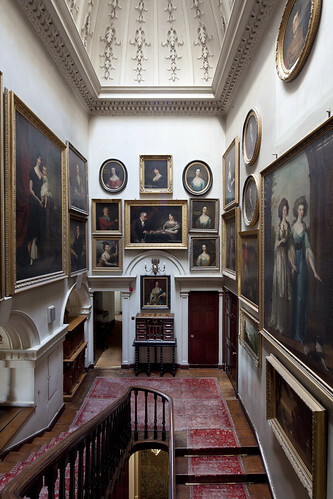 Picture hanging is taken to the extreme in the hall of the eighteenth century house Arniston where the ancestors watch the stairs. For a picturesque trip to Scotland, pick up a copy of this volume. You'll enjoy the architecture and furnishings and rolling Scottish views. And you won't suffer like the Granthams. Yes, loved this book! As you point out -it's the little details in each of these houses which makes the book special.